If you are looking for some inspiration for your 2011 holiday then why not take a look at the list of top sunshine escapes put together by our holiday partners Eurocamp. So whether you are looking forward to happy days on the beach, exploring new and exciting destinations, sampling the local cuisine or just lazing by an amzing pool you’re sure to find the right holiday park for you. If you are looking for some inspiration for your family holiday then check out this list of favourite family holiday parks. Click on the images to see more about the park and check availability. 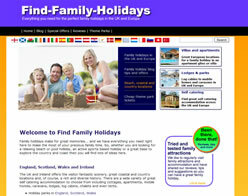 This family holiday park top ten was compiled by our travel partners, Eurocamp. Do you agree with the selections, are your favourites missing? Why not tell us and we can add them to the list.